And thus concludes Chapter 3 of OoME. For now, the comic portion of the site is going to be on hiatus until our little one comes and we can get into a routine. Alli has been having major pregnancy carpal tunnel problems and I’m glad to have the chapter finished even with these setbacks. What does this mean for OoME? Well, we’re not done. Not by a long shot. First and foremost, Alli and I discussed the media being used to output the comic and she found that the colour version of the comic, while not as old-timey as the black and white marker medium, added a certain element to the story. (Get it? Hah!) As such, further comic posts will be in colour. This has also given me a way to help you, the readers, discern the difference between being a human and being an elemental into the comic as noted in the final three panels. 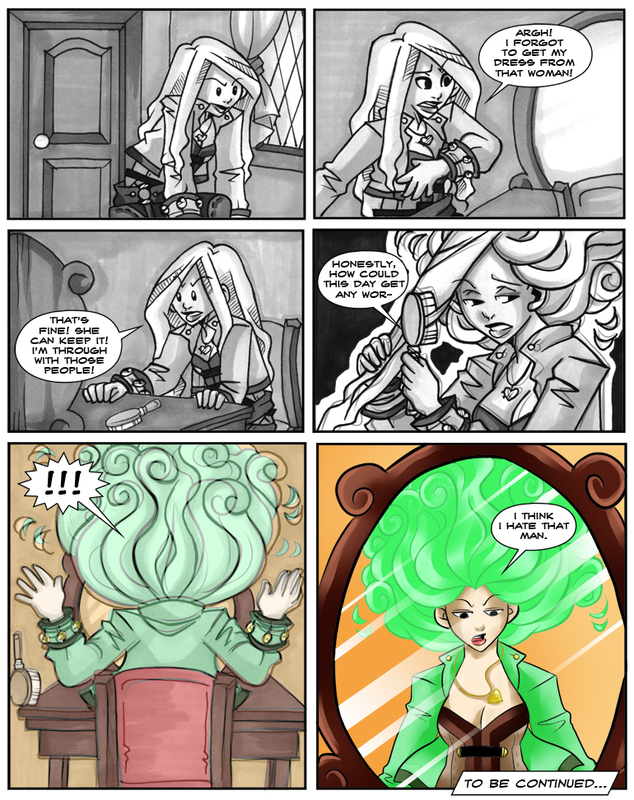 From the lines fading in to different thicknesses, to the colours slowly transcending from their monotone scale to a final, full-blown reveal of Jill with her elemental hair, these panels are more to symbolize Jill’s awakening as an elemental. The extents of what is different will be revealed in Chapter 4 (Probably as Jill yelling at Lucien), but for now, I’d prefer to leave the mystery of what’s different (Other than the obvious) out there for you, the readers, to decipher. As I promised, the Lexicon is getting worked on. More than likely, what will be happening is we’ll be updating the main page with Lexicon entries that will later be placed under their own heading. If Alli is capable, she will provide the pages with a sketch to accompany the details being given, but this will likely only be happening sporadically. To the fans, we’d like to extend out gratitude for staying with us for almost two years. From the month-long hiatus to allow us to buffer to the stops all together due to pregnancy drama and the long rants that I am known for, you’ve stayed with us and hopefully enjoyed our story. So now comes the fun part – as I am working on the Lexicon, I’d like to know what you, the fans, want to know more about. Remember that it won’t be a tell-all listing of every plot point and story arc, but more a generalized list of the whos, whats and wheres of OoME. Anything deemed critical to the plot will not be revealed until an appropriate time, but the basics, like the world, the indigenous life and what’s happened to get the good people of Cog where they are will be provided. As always, thank you for reading OoME and we hope to continue to enthrall you with our story.